Lagos is the second fastest growing city in Africa and the seventh fastest in the world. Fela Kuti and his wives, The Shrine. KIng Sunny Ade, Tony Allen and Urban Nigeria. 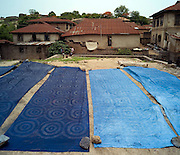 Images of the Wax dying industry in Nigeria.